Diabetes in Women - Are You at Risk? Diabetes in Women – Are You at Risk? 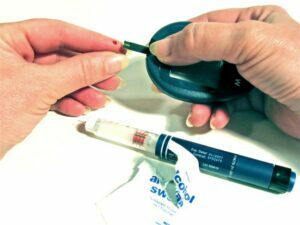 Home » Nutrition & Diet » Diabetes in Women – Are You at Risk? Most women are aware of the connection between obesity and diabetes. But what about other diabetes risk factors? If you’re concerned about your diabetes risk, this article can give you a little bit of insight into what you should watch out for and how to treat diabetes if you have it. When you eat, your food is broken down into glucose. Glucose is a form of sugar that acts as a main source of energy and fuel for your body. During the digestive process, your pancreas makes a hormone called insulin. In order for the glucose from your food to get into your bloodstream, your pancreas must produce the correct amount of insulin. Diabetes is a disorder of this metabolic process. In women with diabetes, the pancreas does not produce enough insulin or the cells do not respond correctly to the insulin. This causes glucose to build up in the blood where it is excreted into the urine. Since the body is unable to get enough glucose into the bloodstream, it cannot get the fuel and energy it needs to sustain itself. There are two different types of diabetes that have different risk factors associated with them. They are type 1 and type 2 diabetes. Type 1 Diabetes – Type 1 diabetes is an autoimmune disease. In this type of diabetes, the pancreas completely stops making insulin. Type 1 diabetes risks include infection or illness, disease or injury of the pancreas, and family history of the disease. Genetic factors play a large role in the development of this type of diabetes. If you have an immediate family member with type 1 diabetes, it is strongly recommended you get tested for this disease. Type 2 Diabetes – This type of diabetes is the most common form of the disease. Type 2 diabetes is also called insulin resistant diabetes because though the pancreas produces insulin, the cells do not respond appropriately to it and illness results. The most common type 2 diabetes risk factor is obesity. Obesity and diabetes go hand in hand. Unlike type 1 diabetes, this type can be controlled with diet, lifestyle changes, and herbal supplements. In addition to family history and obesity, other diabetes risk factors include high blood pressure, sedentary lifestyle, polycystic ovarian syndrome, age, and ethnic background. For example, Hispanic, African-American, Native Americans, Asian-Americans, Alaskan Natives, and Pacific Islanders are all more at risk for developing this metabolic disorder. To find out if your symptoms are the result of diabetes, make an appointment with your doctor. He will do a full evaluation and take some blood and urine samples. The treatment for diabetes will depend on the type you have. People with autoimmune type 1 diabetes will need to take insulin injections for the rest of their lives. Some may even rely on an insulin pump to deliver a steady dose of insulin 24 hours a day. The most common conventional treatment for type 2 diabetes is prescription oral medication. Sulfonylureas (Glucatrol)– This type of medication forces your pancreas to make more insulin to lower your blood sugar. Side effects include weight gain, hypoglycemia, skin rash, and gastrointestinal discomfort. Alpha Glucosidase Inhibitors (Glyset) – This diabetes medication blocks the enzymes your body needs to digest starch. This helps control sudden blood sugar spikes throughout the day. The side effects of this medication are typically gastrointestinal. Biguanides (Metformin) – A common type of diabetes medication, this pill works to lower the amount of glucose in your body by keeping your liver from making too much sugar. It can also help lower blood pressure. Unfortunately, there are many side effects associated with this diabetes drug including nausea, vomiting, dizziness, shortness of breath, diarrhea, and kidney problems. Side effects may increase when drinking alcoholic beverages. Nonsulfonurea Meglitinides (Prandin) – This drug stimulates insulin production and leaves you with more flexible mealtime options. Side effects are few and include weight gain and low blood sugar. Because of the side effects associated with many diabetes drugs, more and more diabetes sufferers are turning to natural remedies to combat this common metabolic disorder. Diet – If you’re like most on-the-go women, you probably don’t have a lot of time to think about making the healthiest food choices. Unfortunately, a diet high in processed foods, refined sugars, and unhealthy fats can cause glucose levels to rise to dangerous heights. Diabetic women should opt for a whole-food diet rich in vegetables, whole grains, legumes, fish, poultry, lean meats (in moderation), and good fats such as coconut oil, avocado, whole nuts, and olive oil. Herbs – It has been proven that cinnamon can be an effective natural treatment for diabetes. It has been shown to safely lower fasting blood glucose levels without the side effects associated with prescription medications. Ginseng is another effective diabetes herb as it slows carbohydrate absorption and increases pancreatic insulin production. Supplements – Many women today have a magnesium deficiency, which can lead to depression, anxiety, irritability, and increased risk of diabetes due to abnormally high glucose levels. Adding 250-350 milligrams of magnesium to your diet can help lower your blood sugar and improve insulin function. For the nerve pain associated with diabetes, evening primrose oil can help. The gamma linolenic acid helps soothe nerve pain and can also ease insomnia. As with any natural remedy, talk with your doctor or a qualified naturopath about your natural diabetes treatment options before adding herbs and supplements. Women on prescription medication of any kind should consult their doctor of pharmacist before adding natural remedies to avoid dangerous drug interactions. When it comes to diabetes risks, there are more than one to contend with. This good news it, your type 2 diabetes risk factors decrease when you lose weight, switch to a healthy diet, and add some supplements and herbs. Not only will you lower your risk factor for diabetes, you may just be able to get off the medication merry-go-round and live a more natural, care-free life! Want to know more about your health? Learn about the Common Cancers in Women.